This year’s winner’s jersey was designed by local racing legend and 2008 winner of the BHRR Nate English. FRONT - BHRR winner’s jersey. BACK - BHRR winner’s jersey. 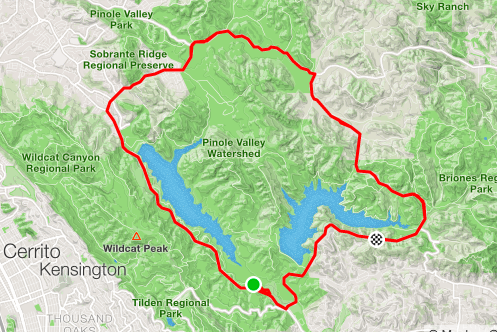 The traditional route for the Berkeley Hills Road Race in the professional category is nearly five challenging laps through what is locally referred to as the three-bears Loop. With a mix of rolling terrain and finishing on a series of challenging climbs, the course is dynamic and provides an opportunity for strong climbers as well as tactically savvy racers. To do well, racers have to be both strong and smart racers. 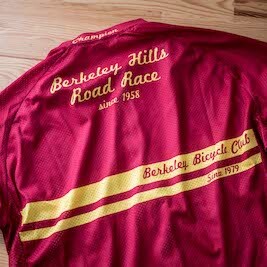 $15.00 from the Berkeley Hills Road Race entry fee goes to the support local cycling and the Berkeley High School Mountain Bike Team. Founded in 1998, the BHSMTB was the first organized high school mountain bike team in the state. 2015 BHRR Women P 1/2 Podium.